I’ll be publishing a few tutorial’s on building Python GUI app’s (pardon the dust, we are renovating!). At work I have been involved with developing a python app running in an embedded Linux system, in which I made an updater on the PC that also ran Python. That updater (which I won’t be covering), updates both the embedded Python app, but also the firmware on the connected STM32 system. Neat! I have explored Kivy and Tkinter and ultimately decided to learn Kivy since it is a modern cross platform framework for constructing GUI’s on Windows, Linux, and Mobile. My plan is to first polish up some of these apps, publish them on Gitlab, and walk you through the development of them (especially the tricky parts). One of the most interesting pieces of hardware that I’m tempted to buy is the Adafruit NeoTrellis M4, since it has a fairly beefy ARM processor (with jtag/swd support). Even though it is fairly cheap, I decided to first make my own NeoTrellis as a Python Kivy app. The NeoTrellis does lots of cool stuff (RGB LED’s, I2C expandable ports, accelerometer, button’s, audio output/input, USB) and what struck me most about it is that it could be used as a keyboard that triggers certain macro’s on a connected PC. Something like this exists on Android with apps such as MacroDeck or as a stand alone USB product called Stream Deck. My idea that I’ll be playing with is to first create a desktop app that can record and playback key presses and mouse actions (hello Keyboard Macroizer! ), and once it’s working, porting it to run on an Android phone (connected to the PC via TCP). Normally I’d buy an existing thing that would do the same thing, but the options I’ve seen are not open source. A few months ago I came across Warren Buffet’s advice on focus while reading Switch: How to change when change is hard, and it was apparent that my focus was divided into too many different projects. As recommended I made a list of 20-ish things that were all competing for my time, and determined which should make the top 5. It was hard to focus on the Meason’s project since it had no clear end goal. One of the biggest things for me is that it’s okay to throw out a working backup system (or project) and start fresh on a better design. Sometimes the existing system can be kept, but it can also be the case that the structure of the old system is restricting you. If an error or failure occurs, email is sent and backup is stopped. I will describe each part of the system and the reasons I designed it in subsequent posts. As of now I can start a backup anywhere and receive email notification of completed updates and backups. It takes about 4 hours from start to finish to perform the update and so far there hasn’t been any problems with the script breaking randomly. log "System Check failed for $NAME, line $LINENO, $retval!" fail "System Check failed for $NAME, line $LINENO, $retval!" I exit the script on the first error because a backup system shouldn’t silently fail but report success. If it fails, it should be quite verbose about it and let you know that it is broken. I’ll post more details about the backup system in later posts, but in the mean time, think about your backups (and test them if you can). I have been quiet on the blog as I focused on becoming an P.E. in Electrical Engineering. Now that I am an Professional Engineer I have more time to focus on the measons project (STM32 Sensor Nodes project). Since my last post I received the PCB’s and they checked out well. The only issue is a button which has the wrong pins going to the footprint (something that is fairly easy to fix electrically). My primary focus has been on firmware development for the Measons. 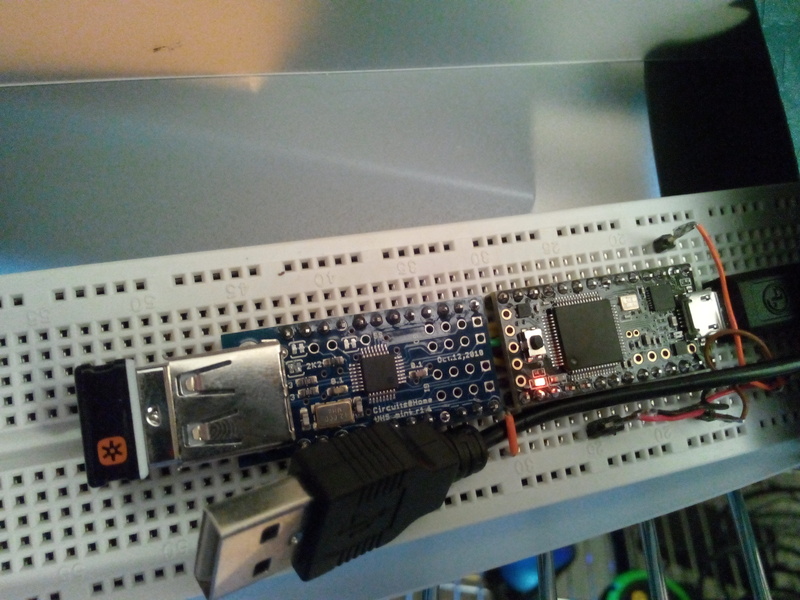 As a recap, the project that I have named Measons is a primarily embedded project with the aim to detect common household failures and to send a text message/email when a failure is detected. Common household failures could be a leaking toilet, water heater, AC drip tray, AC/Heater failure, washing machine leak and stove monitoring. There are two types of measons, a measuring meason and a listening meason, which saves the messages from the network and reports it to a PC. A key feature of this project is that all measons have exactly the same firmware, the only difference between measons is the eeprom that is read on startup. During these few months I have implemented reading eeprom configuration on startup, and having one meason report temperature measurements to another, which then is saved into a CSV using a small python program. Looking at the data I can clearly tell when the AC turns on and off, and the temperature of my router and cable modem throughout the day. I ran this temperature gathering experiment for over a month with excellent reliability. A key problem I discovered was that license that AC6 tools provides on their example code forbids the distribution of the AC6 generated files. Based on this license restriction and the frustration of not being in control of ones own development environment, I switched to using makefiles to generate source code in Eclipse Mars. The linker file was generated from scratch and OpenOCD is behaving as it did in the AC6 System Workbench. This change forced me to learn how makefiles and linker scripts work to a greater level of detail, which is great for my line of work. Currently I am working on a bootloader for the measons which will allow the main application to be updated wirelessly, and for updates to be sent to the entire network. Currently that bootloader works for a direct serial connection, but it needs added support for reading packets over the RF connection. I expect for this to be competed within a weeks time (it sure can take a while to do firmware development when you have a full time job!). 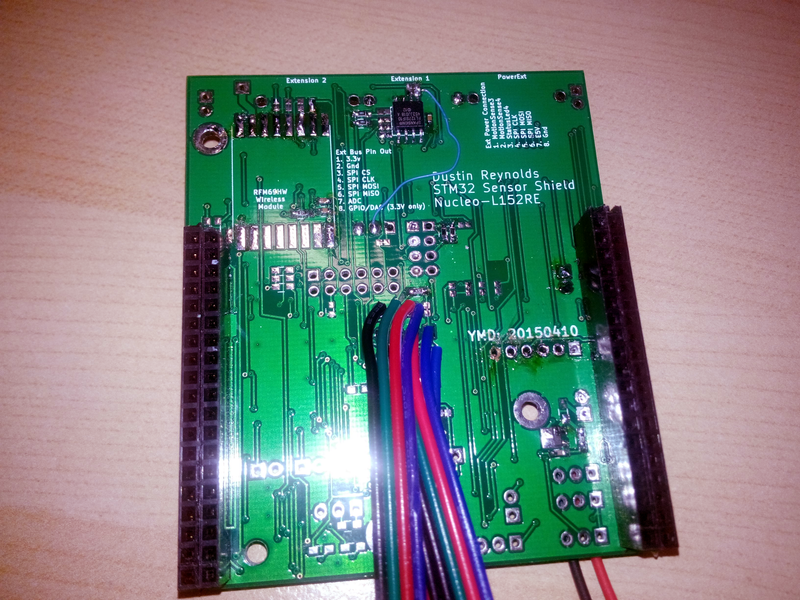 Next Revision of the STM32 Nucleo-L152RE Board Sent! When performing the board bringup for the expansion board, I quickly discovered that I made a mistake on the RFM69HW footprint. Typically when you are numbering a component you continue the numbering on the same side you stopped on (1…8, 9..16). In this case, the schematic footprint I created counted from 1..8, then I started 9 across from pin 1 instead of being across from pin 8. Doh! Here’s a quick picture of the Rev AA board design tested out, with I2C, OneWire, and UART cable connections leaving it. The board itself has the GPS mounted, Ethernet SPI connection, and 128Mb flash chip, mounted and working. Next to the board is a 2 AA cell battery boost chip hot-glued to a AA case. I also discovered that 5 pins that I believed were there, were not present on the L152RE version of the nucleo board. Based on these two details, I decided I would quickly get another board out that would have those details fixed, and any other changes/improvements that I wanted to make. As my Github Readme indicates, the quick update turned into a slight overhaul of the design, where many of the fundamentals remained. My changes to the design have made the board more inline with my end goal of having a multi-purpose board that can interface with a wide variety of sensors and sending that data wirelessly to listening nodes. The schematics show that MotionSense1 and 2 now have the capability to control servo’s, the on board relay can switch up to 30V at 1A, and a built in piezo can be used to get the users attention if needed. I added the ATSHA204A for some potential crypto functionality to handle things such as signed firmware updates delivered wirelessly. It also has a random number generator which can be useful on devices with low entropy. I added a 3.3V regulator for handling the power to all of the connected bus’s so that the power to external devices can be controlled from the processor (which will help us reach an ultra low power state). I opted to send out the first revision of the board knowing that it wouldn’t be perfect, and it turns out I was right. By sending it out and making progress on other projects, I saved a significant amount of time for a $20 set of boards. Having the boards in hand, I quickly checked out the design and found areas that could be fixed and improved. So with this revision of the board I’m much more confident that things are connected the way they need to be, and that I have nice features that I would have wished to have on the AA board, but didn’t (such as an on board relay). Having spent another $20 for a new set of boards is great since I can now focus on writing firmware and software to interface with and take advantage of this board to its fullest! 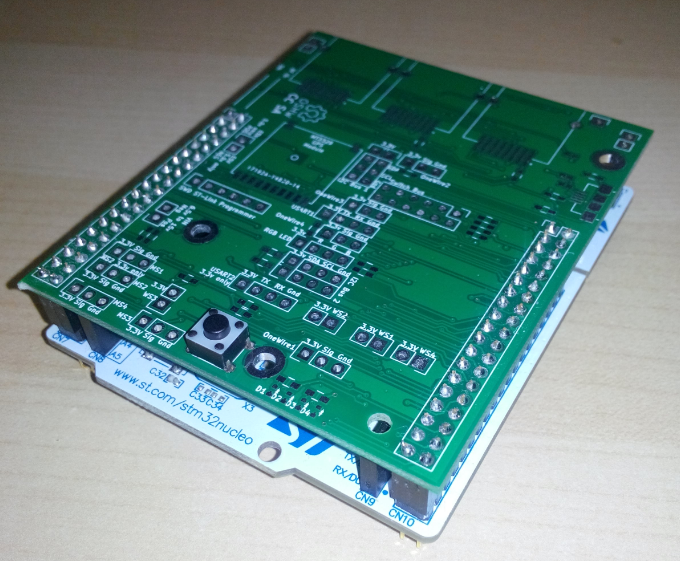 STM32 Nucleo Expansion Board Recieved! This is just a quick post showing the newly arrived PCB’s. I have only found a few errors in the board where the STM32 Nucleo Expansion port didn’t have some signals that I assumed. Luckily I added enough 0 ohm resistors and work arounds so that it won’t be a problem. (Latest schematics on Github show the changes in the Develop Branch). I discovered the problem when adding OneWire support for the DS18B20 temperature sensor. Once I get all of the other sensor ports working I’ll flush out any other unexpected behavior and keep the schematics updated as I progress. I got 10 of these boards for about $20 so it was a really good deal. 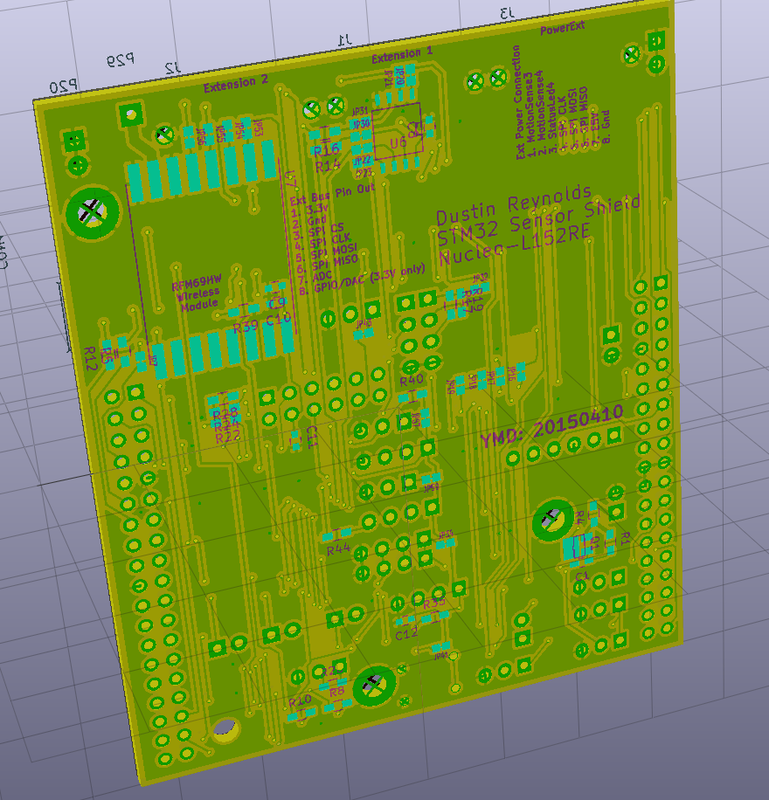 These boards were made in Kicad and the designs and all source code is available on github as explained in this post. After attending Embedded Systems Conference this past week, I’ve got quite a few new ideas to making these sensor nodes firmware more robust, with licensing terms that will allow me to use the software I create in open source projects as well as closed source. So for the past few months I have been working on planning a project that has been on the back burner for quite some time: house hold wireless sensor network. The principal is that I would have micro controllers running in low power mode spread across the house monitoring for special failure conditions, such as the toilet starting to leak. Once a failure condition is detected, a wireless message would be sent and ultimately I would be notified via email or text message of the failure. The ATMega328 based platforms (MiniWireless, ULPNode, JeeNode) all have been exercised in low power modes and would serve well as simple wireless modules for checking simple conditions and sending a wireless message. The downside of the platform is the limited number of interface options and the 8-bit processor itself. The lack of JTAG or SWD debugging increases debugging and validation time significantly. Teensy 3.1’s are a great Freescale platform utilizing the MK20DX256 family of processors. It has a 32-bit processor with a very dedicated designer who is very active in the support forums for the device. One of my aspirations with this project is to be able to wirelessly reprogram all the sensors on the network, and the Teensy 3.1 won’t work in that regard. 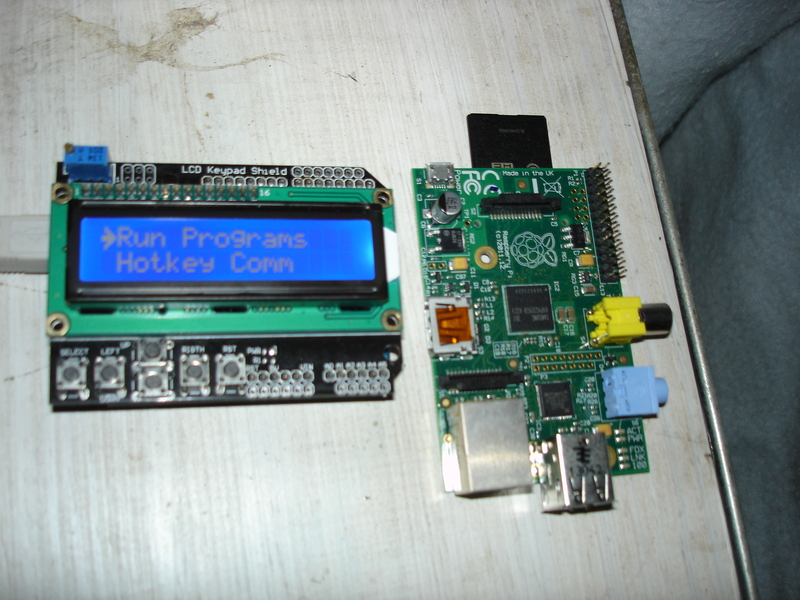 The Teensy 3.1 supports a small microcontroller named HalfKay which runs closed source firmware which makes the Teensy 3.1 easy to program from the Arduino IDE (provided you have the Teensyduino library installed). The Teensy 3.1 is so stable that I have one at home and at work that I use to filter all of my keystrokes to create and replay macro’s. A rather nice side note is that the Teensy 3.1 platform now supports SWD debugging, which involves cutting two traces and soldering a few wires. Freescale’s Freedom-K64F is a feature packed platform which has a variety of sensors already on the board, with bloggers dedicated to the configuration and usage of the platform. One of the key factors in the projects that I choose to work on is the accessibility of the components. Ideally everything that I share with the open source community should be relatively inexpensive to purchase or download. The FRDM-K64F however comes in at $35 plus shipping, which is a bit out of the inexpensive range compared to other offerings. My plan is to have a dozen or more of these sensors around the house so the price for each development board would quickly add up. The STM32 minimum development environment found on eBay is a bargain at under $6 for a fully reprogrammable module. However the support for the cloned hardware is lacking, and useful tools such as a JTAG programmer would have to be purchased separately. 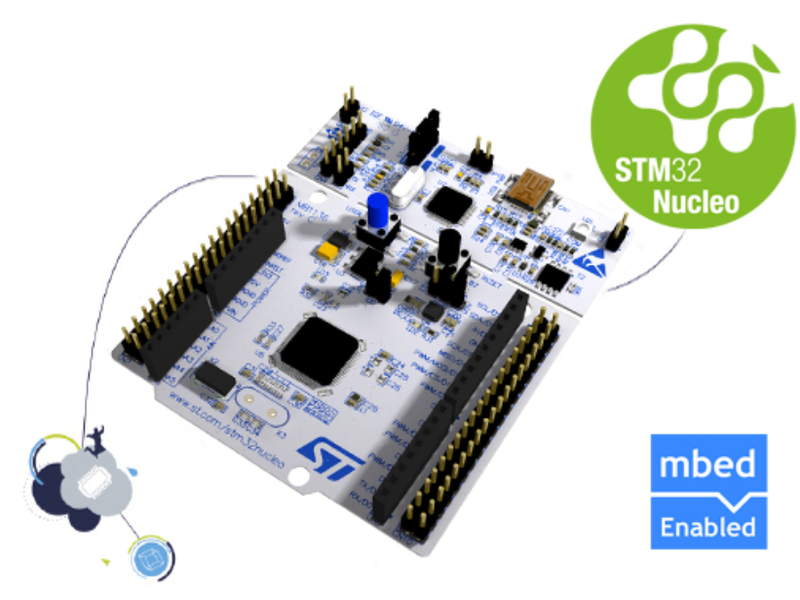 In order to capture more marketshare of the Maker community, ST has partnered with mbed to produce the Nucleo line of development boards to showcase many of their processors. High performance Cortex M4’s are among the lineup as well as low power Cortex M0’s, all priced below $11. After carefully reviewing the available lineup, I selected the Nucleo-L152RE for its low power features and wide range of communication options. It’s the only board that not only has a large programming space of 512KB, but a 16KB EEPROM. 21 Channels for the ADC and two DAC outputs make it an ideal expandable platform. I have already started to work through examples for it and learning the platform in general. The great thing about the STM32 platform is the recent availability of the OpenSTM32 System Workbench. With the eclipse based IDE, it is fairly straight forward to create a new project, compile, reprogram and debug projects using the OpenOCD compatible ST-Link built into the Nucleo boards. AC6, the company that partnered with ST to deliver this great tool, have an update mechanism for not only the eclipse plugin but for all of the dependencies such as GCC and OpenOCD. Unlike other full featured open source development platforms, the only step needed is to install the System Workbench as it takes care of the rest. After working with NXP’s LPC1788, LPC1347, Nordic Semiconductor’s nrf51422, and Texas Instrument’s RM46L852, I find that the development workflow is best in OpenSTM32 System Workbench, followed closely by Nordic Semiconductor’s nrf51422 (after following all steps in Application Note 29 to get a working eclipse setup). Today I sent out an Expansion board for the Nucleo L152RE which takes full advantage of the pins brought out to the Morpho headers ST provides. 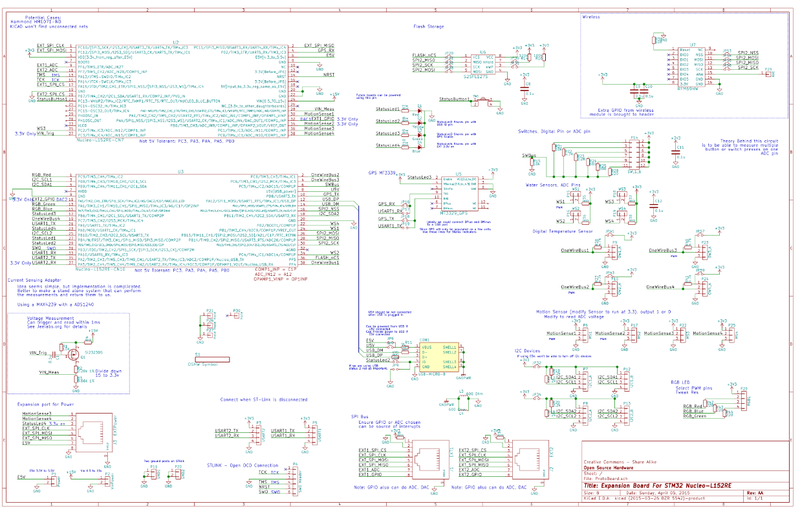 The design, developed in Kicad, is fully open source with a permissive Creative Commons – Share Alike license. Even though I have a full Altium license available, I chose to use Kicad so that anyone can use the designs and all parts freely. The design and design files are on github for download. Do keep in mind that I haven’t tested it yet, so it should only be used as a reference. Once boards come back I’ll populate them and begin testing. 2 RJ-45 connections that each support a SPI bus with a unique chip select, ADC pin, and a GPIO/DAC pin. Most of the pins on the STM32-L152RE can tolerate 5V, so for the pins that aren’t, I’ve added a special note on the pins on the schematic to serve as a clear reminder. Since the last board I sent out a number of comparison tools have entered the market that allow for the quick comparison between the different major part stores (digikey, mouser, newark, etc…) and different major PCB houses. Using both of those I saved over $25 dollars on my small run of 10 boards + parts for 10 boards. For SandSquid, it worked best if I used the manufacture part number rather than a particular store’s part number. So for all of the parts in my schematic I have added field’s to the part that has the manufacture part number, and following the recommended way of Kicad, I modified the python script for BOM generation to throw that part number in a CSV with all of the other fields, so that I can copy and paste it into the example BOM on SandSquid. In the past I have had a lot of success with OSHPark and I have found that their prices are reasonable, but after a quick look at PCB shopper I was able to find a PCB house that would print 10 of my boards for less than half the price to print 3 boards from OSHPark. Since many of those cheap PCB houses are in China, the quality won’t be the same as the quality purple PCB’s from OSHPark, but I decided to take that chance. 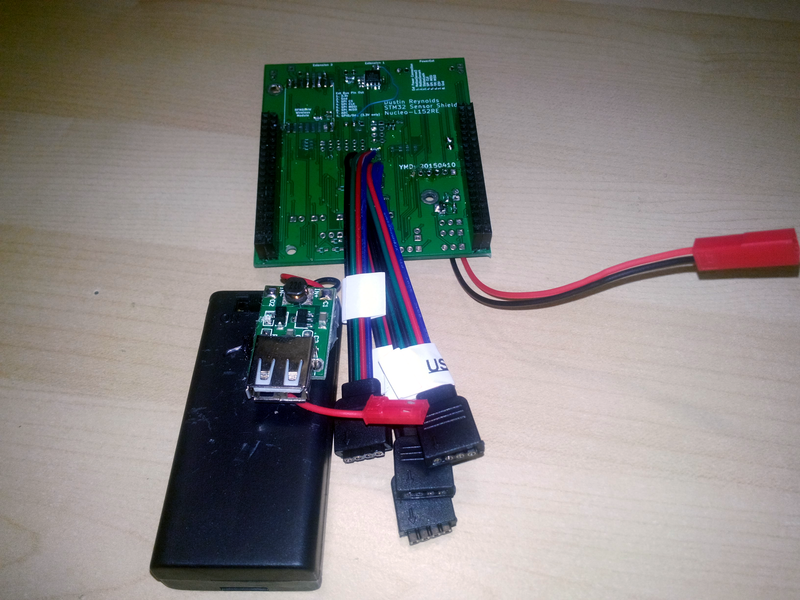 So in summary I have started to branch out into developing on the STM32 family of MCU’s, with an ideal platform for collecting a variety of sensor measurements throughout my home and vehicles. 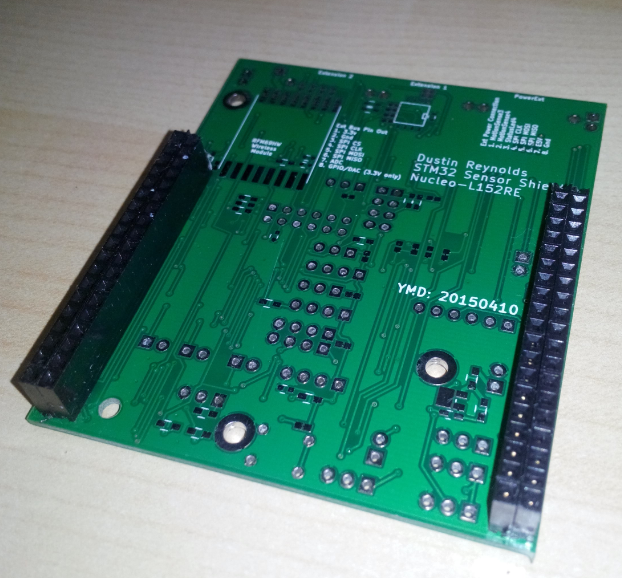 This first revision of the board is meant as a stepping stone, with future open source boards integrating the STM32 processor into a one board solution. By choosing open platforms like Github and tools like Kicad, these designs and firmware can be a benefit to the community as a whole. 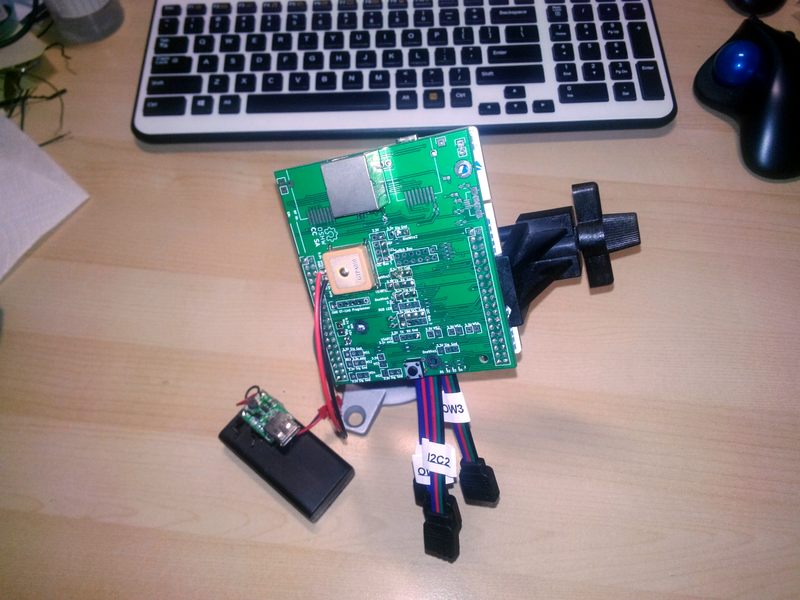 I recently started a project with a Teensy 3.1 and USB Host Shield, I dub it my Keyboard/Mouse Macroizer. The objective was pretty simple: Record and Playback all of the actions one typically does with a keyboard and mouse. This is fairly unique since it can record not only keyboard actions, but mouse actions too. Currently I have two of them and they are my default keyboard and mouse both at home and at work. Today I’ll just be talking about some modifications needed to the default Teensyduino 1.18 to add the necessary support for mice. Apparently there is a bug in the linux driver for mice support, that causes the scrolling action on an absolute mouse, to not be processed by linux. One day I may track it down, but for now, my work a round is to add a second mouse to the USB descriptors that the Teensy passes the OS when it begins the enumeration process. Just so everyone knows, I’m using Eclipse as my IDE for this project since the Arduino IDE is designed for beginners. I would have given up in frustration if I had to use the Arduino IDE to develop these project. I just went and updated Paul’s latest repo with my changes, which are reflected in the following git diff. My recommended method of adding these features, if desired, is to use the application provided by Paul to get the base environment, then add the changes from there. I’ve recently started a job that requires a 1 hour commute each way, and so I decided to make the most of it by listening to audio books. I’ve finished about 3 audio books so far, but I realize that I will soon run out of interesting content to listen to (I’ve been listening to LibreVox free public domain audio books). Exploring the world of Text To Speech (TTS) software led me to first examine espeak, which had too much of a robotic tone for my liking. I then stumbled upon Pico TTS on my cheap android tablet, which sounded too good to be true. Looking around, I found a linux project that uses it, PicoSpeaker. Pico is a TTS solution from the company SVOX Mobile Voices, which apparently specializes in text to speech solutions for devices. I’m not sure how the product ended up in linux as the packages sox and libttspico0, but they are their, and they work reasonably well. The frustrating problem I found, was that PicoSpeaker didn’t accept large files. So frustrating was this problem, that I continued to look around at different fixes. I then checked out Festival, installed better voices, and still found the quality lacking in comparison to Pico TTS. I played with the gain, rate, pitch to make the different voices sound better to me, but it failed to make a difference (I tried out the MBROLA and CMU Arctic voices, samples here). Even though I could convert a complete file with these, they didn’t sound as good to my subjective ears. I run this script by making the script executable (chmod +x convert.sh) and provide it with the base name (Ebook_ in this case), the title of the Author (“Henry Thoreau” for example), and the title of the book. Note that if any of those have spaces, you need to put the words in quotes. The end result is a pretty decent sounding audio book, that I can actually play at 120% (with the -r 20 flag provided to picospeaker) with all of the words intelligible. Here is a 6 minute sample of the audio, uploaded on Picosong (Picosong seems to be like the imgur of audio links, pretty nice service). This is a sample of it as I like to listen to it. Note that this creates a larger file than the ogg, I’m not sure of the settings to make it better, but for now it will work. Better to ship something working, than nothing at all. 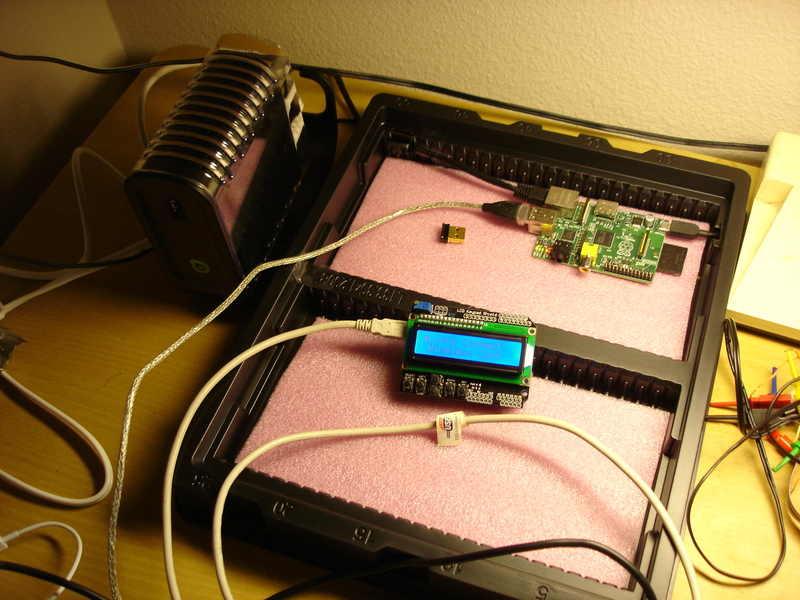 Can flash over the network for Raspberry Pi’s, Pogoplugs, and normal Linux machines. Ever since I read this post, I wanted to see if I could reliably flash Arduino’s over my network. I’m pleased to announce that I can, and my plan is to share the juicy details so that you too can enjoy being able to reprogram your projects from the comfort of your main machine. RFC2217 is a standard that lets you read and write to a serial port, over your local network. It not only sends data, but it lets the remote client send RTS and DTS signals, which allow you to reset the remote AVR. The general standard gives us some nice flexibility, letting the remote client control the serial port as if it was right there. Why would you want to do that? Well, I can do my main programming on my main machine at my comfortable desk, while having my AVR microprocessor in the hot garage next to the Raspberry Pi/Pogoplug, connected to the network. Developing on a Pi or Pogo is slow, so if I can leverage my powerful system to do the development on, and delegate the Pi to just the flashing part, then it reduces one more barrier to having network capable, field re-programmable devices everywhere. A big advantage for me is that now I can completely contain my development environment into a virtual machine, which can be backed up, moved to a different machine, or saved/resumed. If there are enough requests, I can see if I can upload the machine somewhere for easy download. The RFC2217 standard would allow for some pretty interesting things. I could have an Linux Serial Commander connected to one computer, that controls the Raspberry Pi + monitor in the other room. With SSH tunneling, I think I could flash firmware over the internet (I will test this soon), so that all you would need is a Linux system on the wifi, to be able to reprogram any networked RFC2217 AVR within that network. Another idea is if you need to reprogram your AVR based sprinklers, instead of bringing it inside, you just bring a Raspberry Pi + USB wifi adapter + batteries + serial cable to the unit. Push a button, and the firmware is flashed from your remote computer. Pretty awesome. I’ve uploaded this updated LScreamer to bitbucket this time, a link to it should be in the side bar. Feel free to ask any questions about getting started with LScreamer. 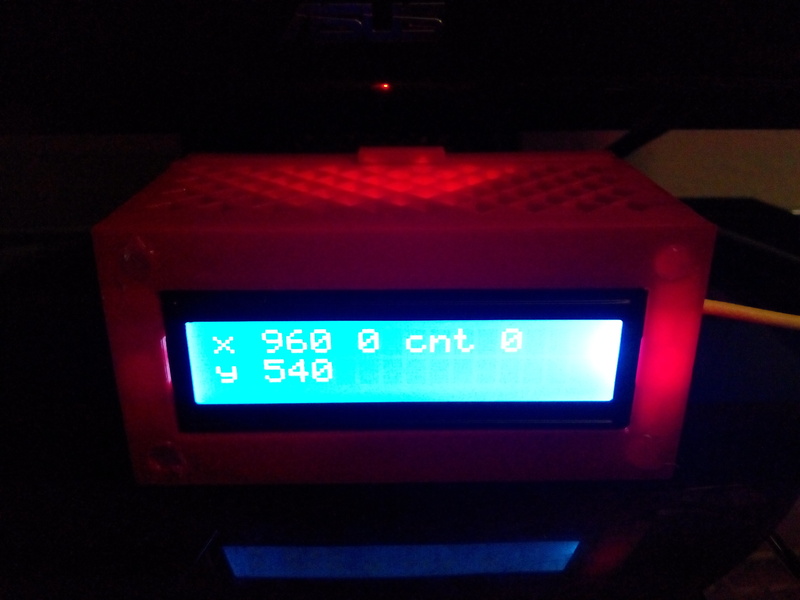 Recently I was playing around with the Raspberry Pi and thought of how useful it would be to pair an 16×2 character LCD + buttons with it so that I could control it on the go. After a few hours of brainstorming, I came up with the Linux Serial Commander, which is an Arduino + LCD + buttons, paired with a Linux system running a python server that I wrote. Linux Serial Commander operation from Dustin Robotics on Vimeo. Donation Link If you appreciate the content and want to see more of it, feel free to donate here!